In any competitive environment, success comes to those with strengths, the skill to apply them and who have a strong commitment to innovation - the same also applies to the energy efficiency of rotary screw compressors. To become a true efficiency leader therefore, it is crucial to meet both current and future requirements. The new DSD series from Kaeser meets all of these needs and more. 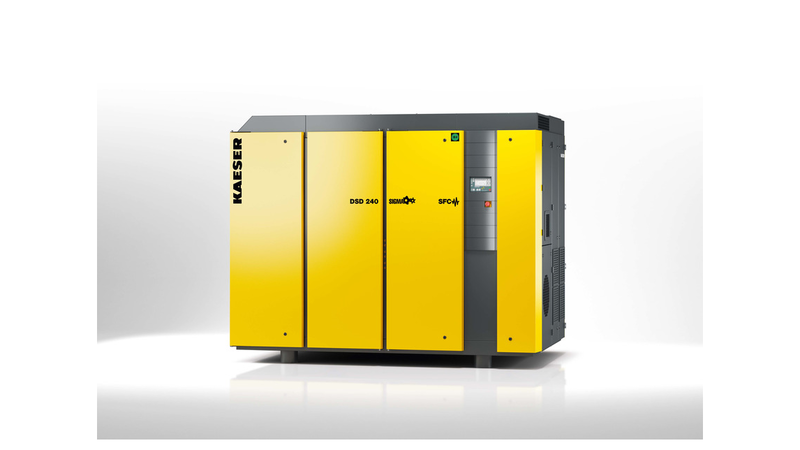 The next generation of DSD-series rotary screw compressors is now available for flow rates from 14 to 25 m³/min. Featuring all-new airends with high efficiency Sigma Profile rotors and IE4 motors, they deliver improved specific power of up to nine percent as well as up to six percent greater flow rates than previous models. The new IE4 Super Premium Efficiency motors, the most efficient currently available, also help to achieve this improvement and therefore enable peripheral losses in compressed air production to be reduced even further. Moreover, the Electronic Thermo Management (ETM) system regulates oil temperature to ensure a safe and consistent differential from the dew point temperature. This strategy also prevents unnecessarily high airend discharge temperatures and provides additional energy savings. Heat recovery offers yet another key way to boost energy savings: a compressor transforms 100% of its input electrical drive power into heat, of which 96% can be recovered and reused for heating purposes. Kaeser engineers have now expanded the range of heat recovery options of the company with a small yet highly beneficial detail. In systems taking advantage of the heat recovery option, a second electronic Thermo Management system ensures optimised and even more efficient use of the available heat energy.